Visitors are always welcome to our monthly meetings, come along and see what it's all about or take a look at our programme and put the date in your diary. 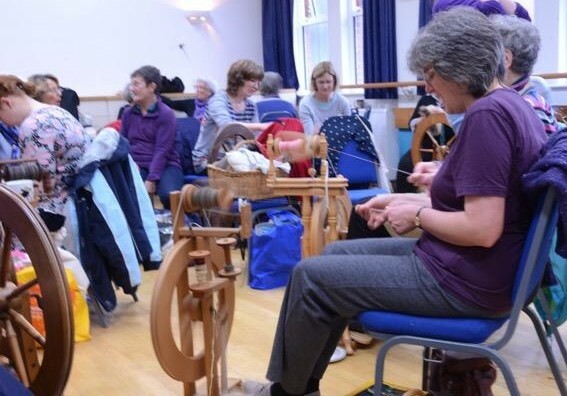 We are a diverse group of weavers, spinners and dyers, beginners to experts, young and old, who all share a love of textiles and desire to learn. Our meetings take place between 10am and 4pm on the second Saturday of the month except during July and August when there are no meetings. We meet at Greyfriars Community Centre in Ringwood where you can phone and leave a message for us. Existing membership is renewed on 1st January for 1 year and we are affiliated to The Association of Guilds of Weavers, Spinners and Dyers. Guild meetings are free to members. Visitors are welcome and currently a small fee is charged of £4. At our meetings we have a sales table and notice board where members are able to sell surplus equipment/materials/new items (not necessarily fibre related) etc with the guild taking a commission of 10%. We have a rota of members who assist on the sales table through the year. We have a guild library that you are welcome to use without cost. We also have a variety of equipment wheels/looms etc available to loan. We recently purchased an electric carding machine that can be used for a small fee either on a guild day or to take home. Please ask a committee member to assist you if necessary. The kitchen is available to make tea and coffee, biscuits also are available and often cakes which our members contribute. If guild members demonstrate their craft at external events on behalf of the guild the event leader needs to notify our diary secretary in writing (for insurances purposes) and obtain relevant guild advertising materials. Each year in July we have a marquee at the annual New Forest Show, where we showcase our crafts. We hope you will come along to help and join in the fun. As stated, we are affiliated to The Association of Guilds of Weavers, Spinners and Dyers. The association publishes an excellent quarterly journal which as a guild member you can purchase for a discounted subscription, managed by the journal secretary. If you have any questions, queries or good ideas please have a chat to me or one of our committee members. We hope you will enjoy finding out more about us and may be tempted to visit our regular guild meetings.